The Embassy of Pakistan, assures all members of the Community that such malicious and obnoxious calls are not being made from the Embassy Staff. We suspect that the Embassy Exchange might have been hacked. The Embassy of Pakistan, Paris has already launched the complaint with Service Provider and the authorities concerned. According to International Civil Aviation Organization (ICAO), Manual / Hand written passport (Non-MRP) will phase out with effect from 30 September 2016. 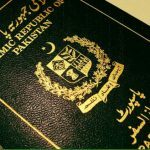 Foreign governments may deny visa or entry to persons travelling on manual passports after 30 September 2016. All members of the community are requested to immediately apply for Machine Readable Passport (MRP) to avoid any inconvenience. Paris, 25th September, 2016. Paris University Club won the second edition of Jinnah Champions Trophy final after beating Dreux Cricket Club by scoring 243 runs against 216 runs in a closely contested match held today at the Cricket Stadium of Dreux, a small town outside Paris. 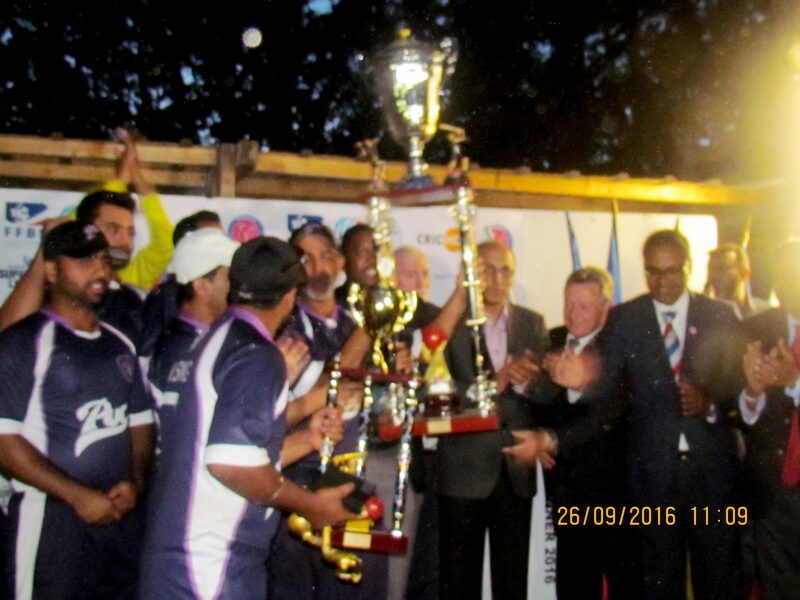 Jinnah Champions trophy jointly organized by the Embassy of Pakistan and France Cricket (Official Cricket body of France) was the second such event after successful aunch of the inaugural edition of the “Champions League” T-20 Cricket tournament, under the title of Jinnah Trophy during summer of 2015. 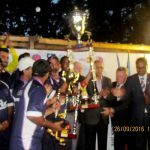 The closely contested final match was witnessed by large number of foreign and local dignitaries, including senior diplomats from the cricket playing nations, senior officials from the French Ministry of Sports and the city administration. 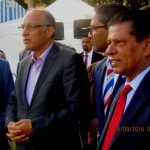 French Women National team, President West Indies Cricket Board, President France Cricket and Chief Selector France Cricket also witnessed the final match. While playing first the Paris University Club scores 243 runs with the loss of four wicket while Mr. Ali Virk emerged top scorer with 95 runs. The Dreux Cricket club started its inning with a promising start but ended up scoring 216 runs. Jinnah Trophy has become a symbol of Pak-French friendship and will prove a via media for promoting people to people contacts between Pakistan and France. While speaking before the award giving ceremony the Ambassador Moin ul Haque said that Jinnah Trophy has become a symbol of Pak-French friendship and will prove a via media for promoting people to people contacts between Pakistan and France. 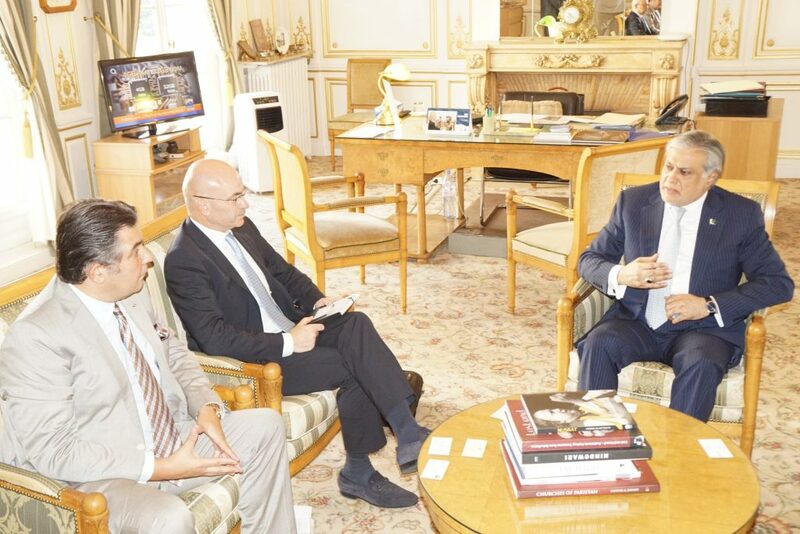 The Ambassador said that Pakistan has always been associated positively with the sport of cricket, especially in France where cricket is becoming increasingly popular. He said that the aim of sponsoring this event was to highlight and promote the role of Pakistan in stimulating cricket in France and helping France in developing the sport of cricket. 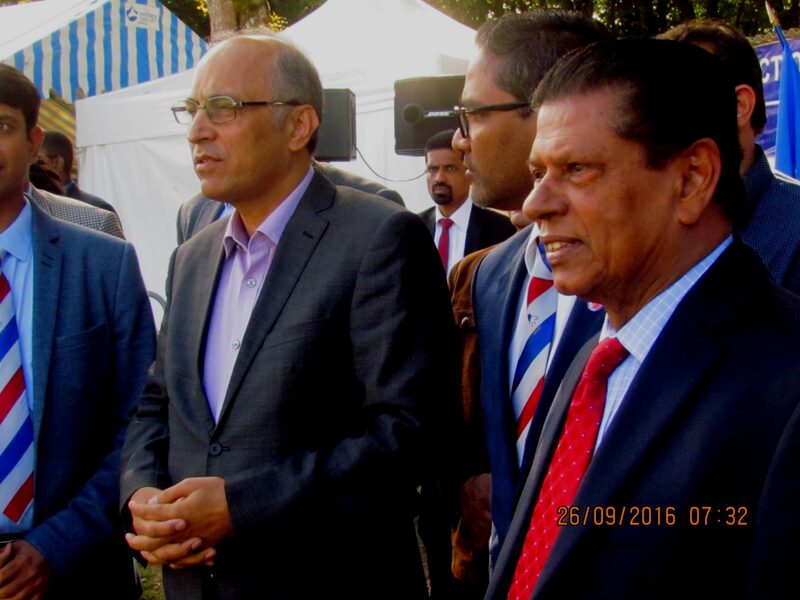 Mayor of Dreux while speaking on the occasion thanked Ambassador of Pakistan for sponsoring the event and hoped that it would help to popularize cricket in France. The ambassador of Pakistan in France Mr. Moin ul Haque was joined by the ambassador of Sri Lanka in Paris, France to give away Jinnah Trophy to the winning team. Trophy was envisaged to be held for three years (initially) and is currently the most prestigious cricket tournament in the cricket circuit of France. ICC representatives, the French Sports Ministry, French administration and French cricket clubs also took active part in making the championship a resounding success. 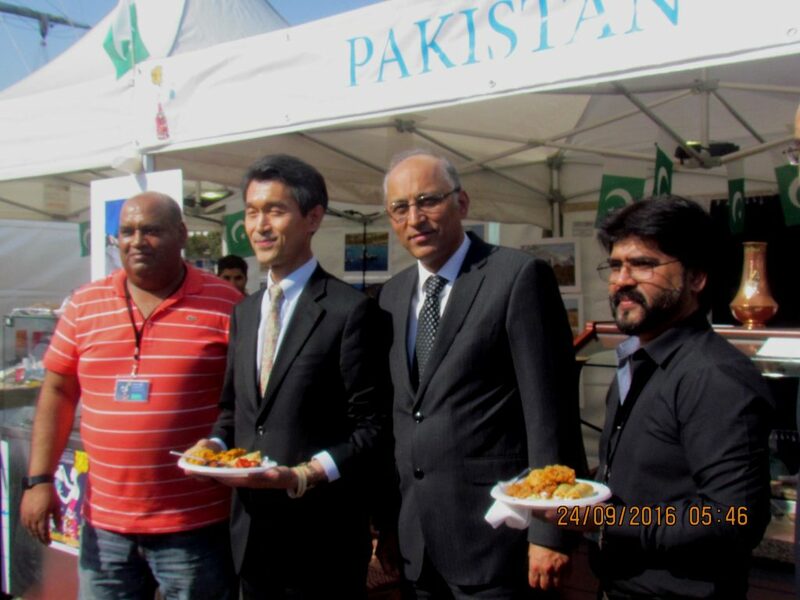 Paris, September 23, 2016: A stall of Pakistani authentic food was thronged by people of many nationalities especially the French food lovers at the international food festival held at the banks river Seine in Paris, today. 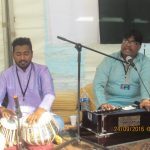 The delicious food presentation was topped by live performance of Sufi music. 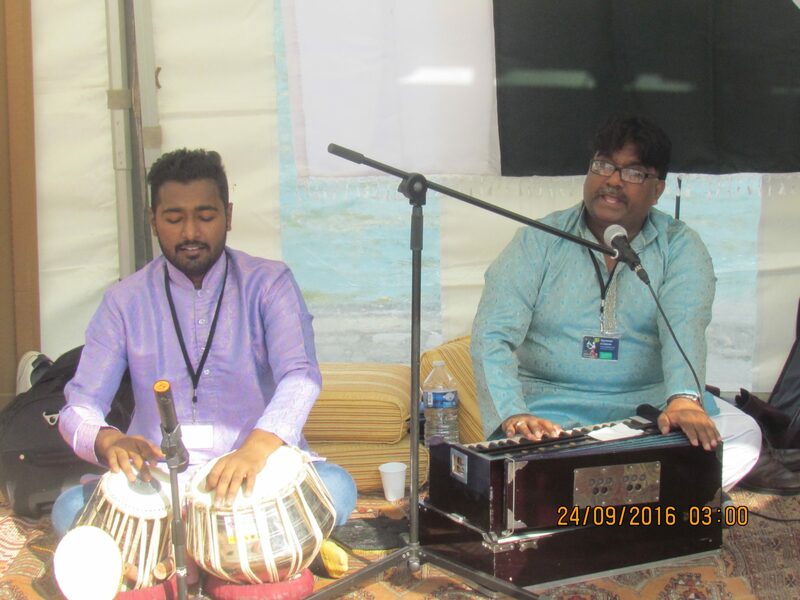 Pakistan Qawal Mr. Riaz Javad accompanied by Mr Suhail mesmerized the visitors with their melodious Qawalies. Over forty countries from around the world are taking part in the three day International Food Festival organized by the French Ministry of Economic, Industry and Statistics. 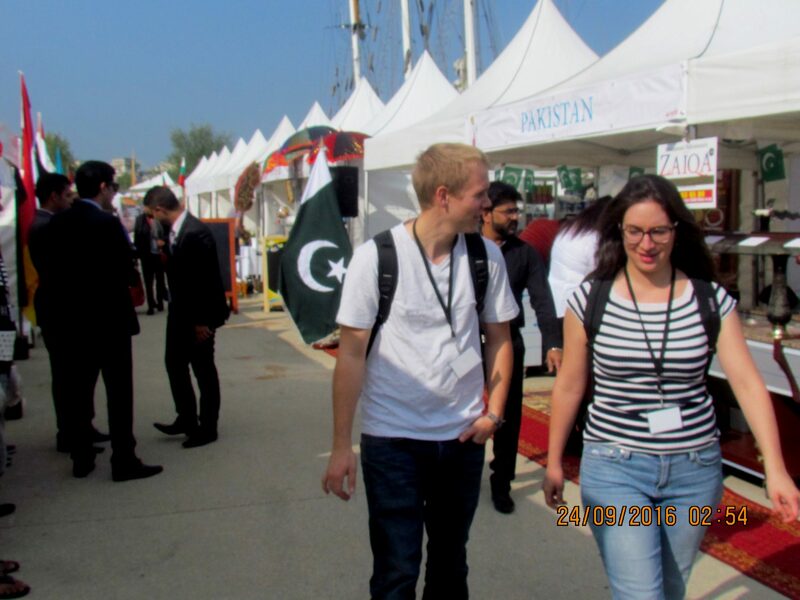 The Pakistani Stall was artistically adorned with traditional Pakistani handicrafts which provided added attraction for the visitors. 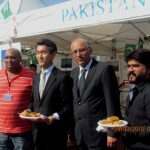 The Ambassador of Pakistan Moin ul Haque who inaugurated the Pakistani Food Stall speaking on the occasion said that Pakistani’s participation in the event would help in promotion of Pakistan’s soft image. He appreciated the Pakistani chefs and the musicians for their contribution in making the Pakistan’s participation in the International Food Festival a resounding success. Paris, September 15, 2016: France is willing to bolster trade and economic ties with Pakistan and to mutually benefit from conducive investment environment in the country. Pakistan has made impressive economic gains in the last three years, characterized by macroeconomic stability, fiscal discipline, sustained growth rate, and record- breaking performance of its stock market. Pakistan can maintain high growth rates in the coming years with continuation of current policies. The achievements in the war against terrorism are equally laudable. 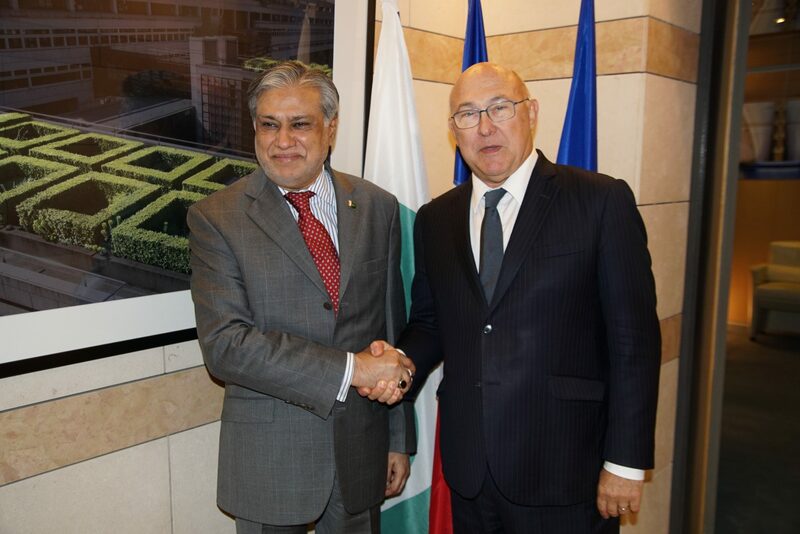 These views were expressed by Mr. Michel Sapin, French Minister for Finance, Economy and Industry in his meeting today in Paris with Senator Muhammad Ishaq Dar, Minister for Finance, Revenue and Economic Affairs. He congratulated Senator Ishaq Dar on presiding over the economic resurgence of Pakistan. 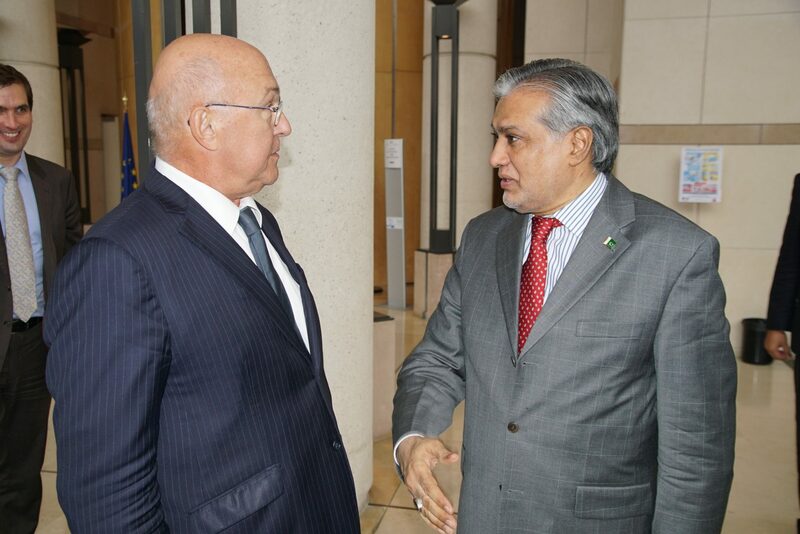 Senator Ishaq Dar told Mr. Sapin that Pakistan infused a number of bold structural economic and fiscal reforms together with stabilization measures to make the country’s economy stable. The positive trajectory has been acknowledged by renowned international economists and financial institutions, which are projecting Pakistan to be one of the top 20 economies of the world in the coming decades. It is about time for Pakistan and France to step up their efforts to enhance the trade and economic ties between the two countries for the mutual benefit of their people. He added that it is about time for Pakistan and France to step up their efforts to enhance the trade and economic ties between the two countries for the mutual benefit of their people. There is a need to explore new avenues for further cooperation in diverse areas including energy, agriculture, food processing, aviation, information technology, automobiles and engineering. 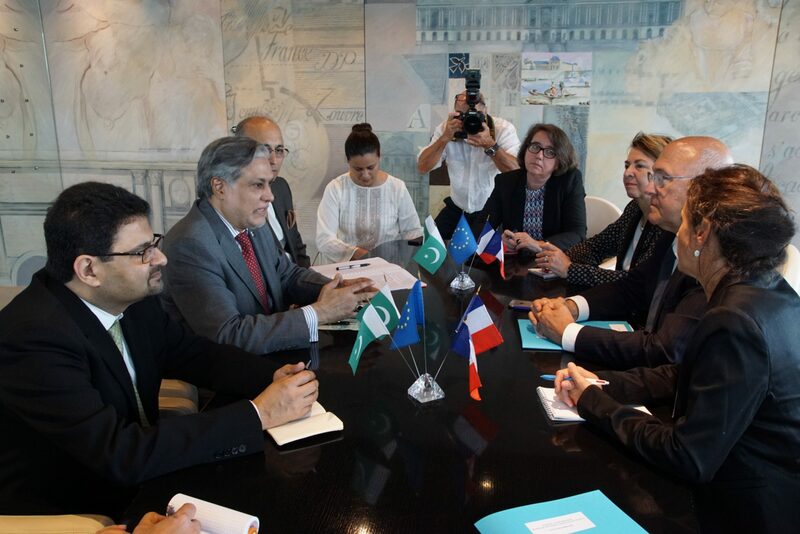 Noting with satisfaction that business communities of France and Pakistan are already engaged in negotiations on several projects, both the Ministers agreed to facilitate the businessmen and to significantly raise the current level of bilateral trade through joint efforts. They also agreed to discuss upgrading of the Administrative, Economic and Trade Committee to Ministerial level in the form of Joint Economic Commission. 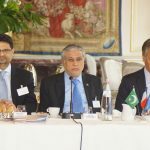 Senator Ishaq Dar invited the French Finance Minister to visit Pakistan and see for himself the economic transformation going on in the country. 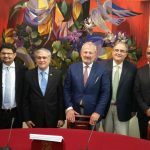 Paris, September 14, 2016: Pakistan became a signatory today to the OECD Multilateral Convention on Mutual Administrative Assistance in Tax Matters. 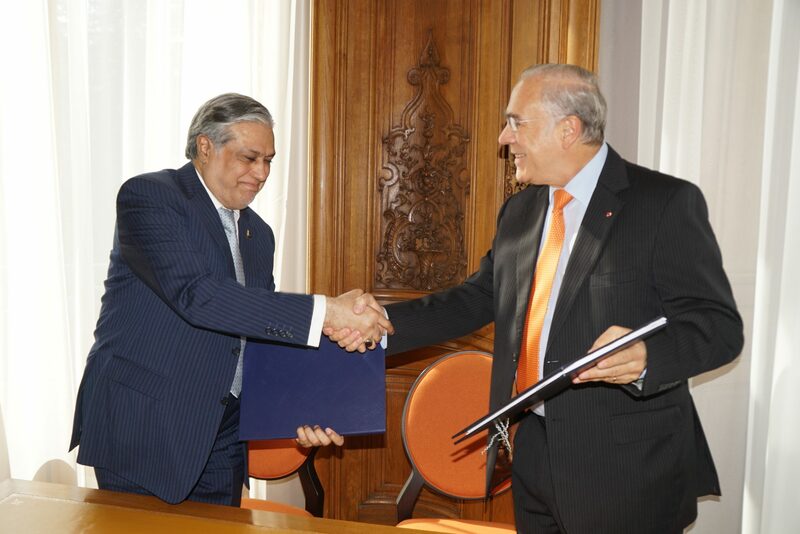 Senator Mohammad Ishaq Dar, Minister for Finance, Revenue and Economic Affairs signed the Convention along with Mr. Angel Gurria, Secretary General of the Organization for Economic Cooperation and Development (OECD) in a dignified ceremony in Paris. 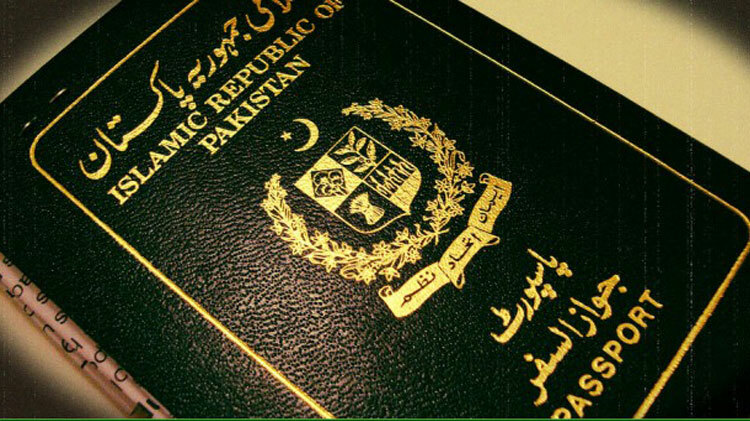 OECD invitation to Pakistan to sign the Convention was possible after a long process of over two years which included peer reviews and amendments in Pakistani domestic income tax laws to meet the requirements of OECD. It demonstrates Pakistan’s strong commitment to adopt international best practices in the field of tax matters and join the multilateral fight against tax evasion through mutual, auto and spontaneous exchange of information. The Convention, which is currently signed by over 80 countries, would facilitate international cooperation on national tax laws and provide administrative cooperation among member countries to combat tax evasion. 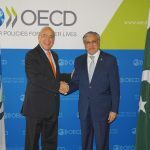 The Finance Minister also held a bilateral meeting with the OECD Secretary General to discuss ways and means to further strengthen the existing ties between Pakistan and the OECD. 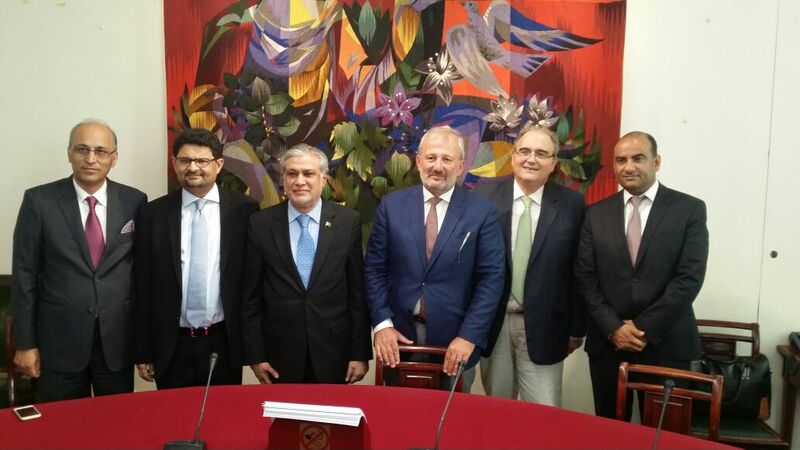 He conveyed Pakistan’s desire to become a key OECD partner country. 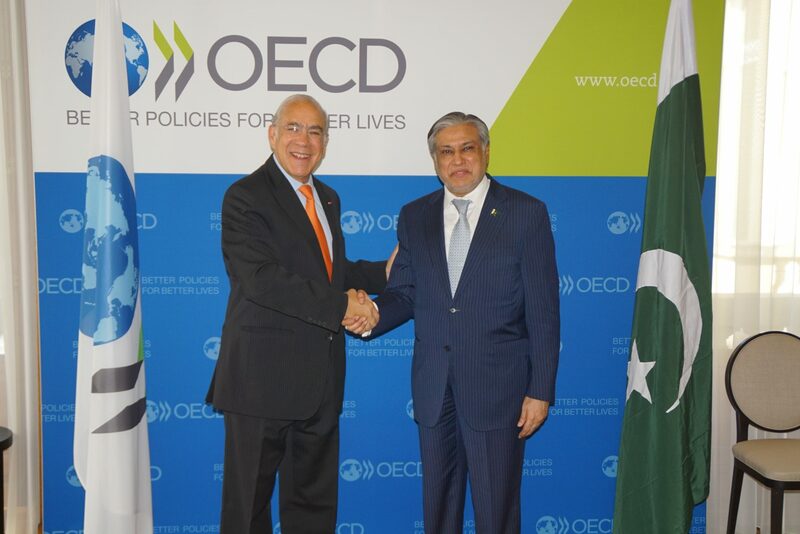 He reaffirmed Pakistan’s determination to cooperate with the OECD on all important areas of mutual interest. He informed the Secretary General about the various economic and fiscal reforms undertaken by the government to stabilize Pakistan’s economy, and the increased budgetary support for health and education sectors. He also invited Secretary General to visit Pakistan. The Secretary General congratulated the Finance Minister on historic signing of the Convention on Mutual Administrative Assistance in Tax Matter, and for his central role in economic turnaround in Pakistan in the last three years. He acknowledged that Pakistan has made great strides in economic field, which has deservedly received accolades from international financial institutions. He invited Pakistan to take part in various OECD global fora and meetings. The OECD is an intergovernmental forum, which focuses on issues including trade, taxation, environment, technology and education. It has 35 member countries in Europe, Americas and Asia Pacific. Pakistan, though not a member of the OECD, has been regularly invited to participate in its various committee meetings. 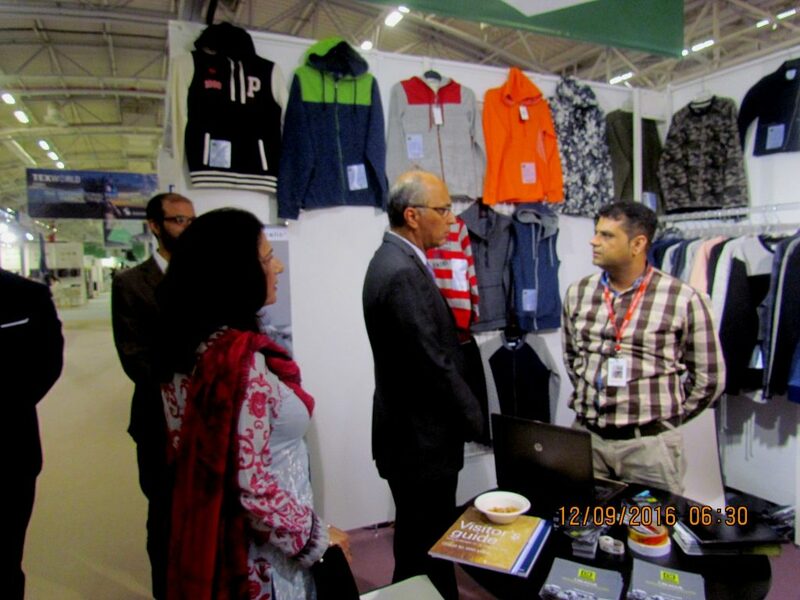 Paris, September 12, 2016: Pakistan high end textile products displayed artistically was viewed and appreciated by thousands of participants, visitors and business persons in the 39th Edition of four day Texworld Exhibition being held in Paris, France from 12th September 2016. 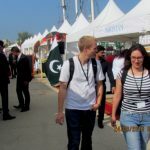 Pakistan cotton and cotton based high end products which included apparels, garments and finished and unfinished associated products displayed by over 33 Pakistani renowned companies were one of the main attractions of the exhibition. 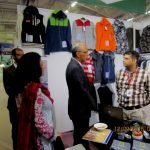 The businessmen who attended the exhibitions from over 26 countries visited the Pakistan stalls and showed keen interest in the high quality Pakistani textile products. The Ambassador of Pakistan in Paris, France His Excellency, Moin ul Haque visited the exhibition and met with the organizers of the Pakistani exhibitors. He appreciated the businessmen and Pakistani companies which have participated in the exhibition in Paris France which is world’s tops fashion and apparel hub. He said the introduction of the Pakistani high end and top quality textile products in Paris France will certainly help Pakistan in boosting its exports of textile and associated products not only to France but also to rest of Europe. While taking to the media during his visit he said that current government of Pakistan has taken number of steps to give impetus to industry and trade and commence in the country. He added that as result of the successful energy policy of the government, uninterrupted electricity and gas is being supplied to the industries along with unprecedented upgrading and construction of new road network which has given added impetus to growth and development of industry specially the textile industry in Pakistan. He stressed the need for diversification of textile products and the textile markets with is view to add upon the profit margin and increase the value of the exports. The Ambassador also advised the representative of TDAP and commercial councilor to extend all out assistance Pakistani exporters in their effort to promote textile export in France to the facilitate the Pakistan textile manufacturing and help them in establishing network with buyers in France and to improve the presentation and diversify the products being displayed in the exhibition in future. The Texworld which is organized in Paris France twice in a year first in February and later in September every year cater to the entire market of Europe and is being participated by 1147 renowned textile related companies from around the world. .
Paris, September 13, 2016: Senator Mohammad Ishaq Dar, Minister for Finance, Revenue, Economic Affairs, Statistics and Privatization presented a strong case about Pakistan’s economic turnaround in the last three years, to a large gathering of senior executives of more than sixty leading French companies, who gathered this morning at a business and investment event hosted by MEDEF (Association of French Entrepreneurs) in his honor. 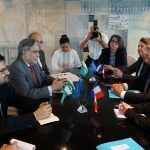 French businessmen are key to strengthen trade and economic linkages with Pakistan and take advantage of vast investment opportunities in all fields of the economy. 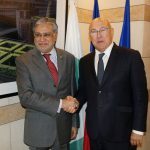 The Finance Minister is on an official visit to Paris, France accompanied by Dr. Miftah Ismail, MOS/Chairman Board of Investment and a business delegation. 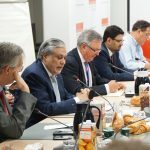 In his address at MEDEF, he gave an overview of Pakistan’s macroeconomic stability, acknowledgement by prestigious international financial institutions of the country’s achievements, improvement in law and order situation, and immense scope for business and investment opportunities in Pakistan. He urged the French businessmen to strengthen their trade and economic linkages with Pakistan and take advantage of vast investment opportunities in all fields of the economy. Earlier, Dr. Miftah Ismail gave a presentation on investment opportunities in Pakistan, assuring the French business community of all the support to engage with Pakistan. Emphasizing Pakistan’s geo-starategic location and the positive impact on economy with the ongoing China –Pakistan Economic Corridor projects, he invited French companies to visit Pakistan and experience first-hand the available opportunities. There was keen interest in the audience about Pakistan’s growing economic potential and its emergence as a hub of economic activity in South and Central Asia. The participants acknowledged the positive developments taking place in Pakistan and expressed interest in diverse areas like construction, agriculture, banking, aviation, transportation and electronics. MEDEF announced that it would take a French business delegation to Pakistan early next year. 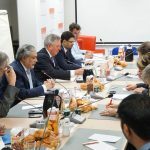 The Finance Minister also held one on one business meeting with senior representatives of important French companies including SNCF (Railways) Airbus (aircraft manufacturer), Suez (energy and gas), Lazard (debt and asset management), CNIM (solutions in energy, environment and defense) and ADIT (consultancy). 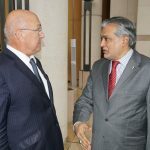 In the evening, Senator Ishaq Dar and Chairman BoI met with Mr. Francois Pupponi, President of France-Pakistan Friendship Group in the French National Assembly. Mr. Paul Giacobbi, Vice President of the Group was also present. 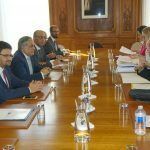 The Finance Minister briefed them about the positive developments in Pakistan, since the present government took office in 2013, including economic stability and successful war against terrorism and extremism. 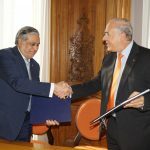 He stressed that the friendship groups in the Parliaments of both the countries could play a pivotal role in bringing the two peoples together and enhancing trade and economic linkages. Both the French Parliamentarians expressed their desire to visit Pakistan later this year with a business delegation. 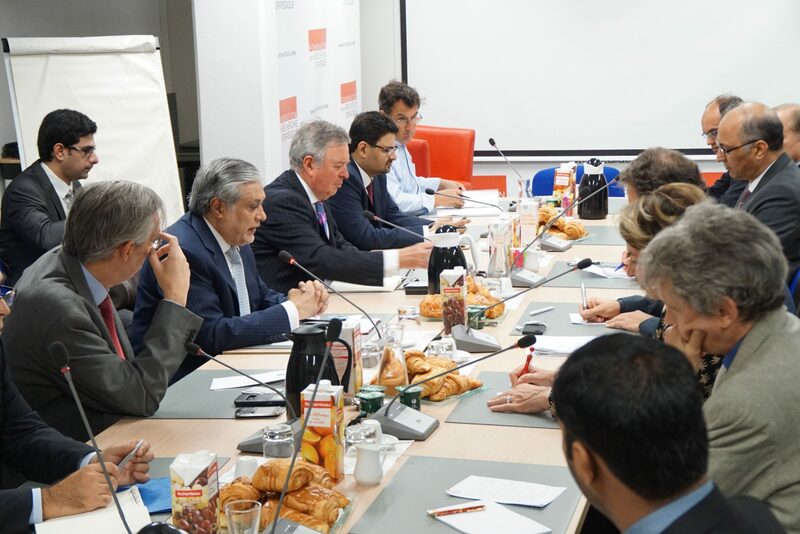 They also appreciated the role of Pakistani diaspora in Pakistan, who are setting an example for other Muslim communities in France to live in a peaceful manner. 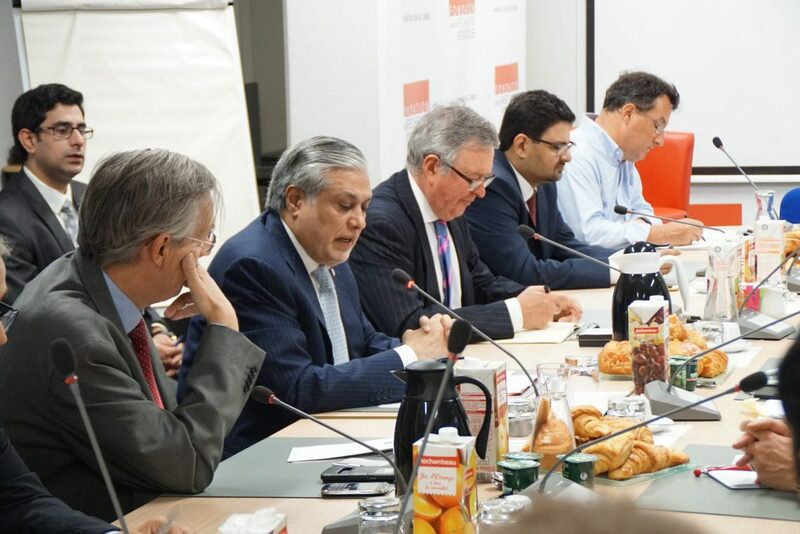 Paris, September 14, 2016: Muhammad Ishaq Dar, Minister for Finance, Revenue, and Economic Affairs has said that tough and deep rooted fiscal, monetary and economic reforms have paved the way for economic turnaround in Pakistan which led to the improvement of fiscal and monetary indicators of the country, recognized and appreciated by Credible international rating agencies.This was stated by him during his address at the Foundation of Strategic Research (FRS), a premier think tank of France, in Paris this morning. The event was jointly organized by FRS and Centre de Recherche International (CERI), another leading thing tank of France. the country had recorded the highest GDP growth of 4.7 % in the last eight years, and is fully set to achieve 5.5% GDP growth during the current financial year and 6% -7% GDP growth in the coming years. In his Talks on the theme, Pakistan and Economic Turnaround Story”, Ishaq Dar said the owing to the prudent and farsighted reforms introduced by the government for revenue generation, tax collection, infrastructure development and increased budgetary allocation to social sector, the country had recorded the highest GDP growth of 4.7 % in the last eight years, and is fully set to achieve 5.5% GDP growth during the current financial year and 6% -7% GDP growth in the coming years. Pakistan’s economic turnaround have termed it the tenth fastest emerging market of the world and have predicted Pakistan to be the 18th largest global economy in 2050. He added that renowned international economists and institutions while acknowledging Pakistan’s economic turnaround have termed it the tenth fastest emerging market of the world and have predicted Pakistan to be the 18th largest global economy in 2050. Finance Minister said that he would like this time frame to be reduced by half. Expressing his grief and sorrow over the loss of innocent lives in recent terrorist attacks in Paris and Nice he said that Pakistan is itself a victim of terrorism for over a decade having suffered immense human and financial losses. He informed the audience that since June 2014, Pakistan has launched the zarb-e-Azb Military operation which has broken the back bone of the terrorists’ organizations and their networks. He said that we are fighting this war to restore peace in our country and for the regional and global peace. The Minister said that Pakistan is committed to build and maintain peaceful relations with all its immediate neighbors and rest of the world. He said Pakistan is ready to talk with India to resolve all outstanding issues including the dispute of Jammu and Kashmir. He drew the attention to the recent human rights violations by the Indian security forces in Indian Occupied Kashmir on the unarmed and innocent Kashmiris to curb their right for exercise of self-determination. He called on France to play its due role as permanent member of UNSC to urge India to resolve the issue of Kashmir in accordance with UN SC resolutions. 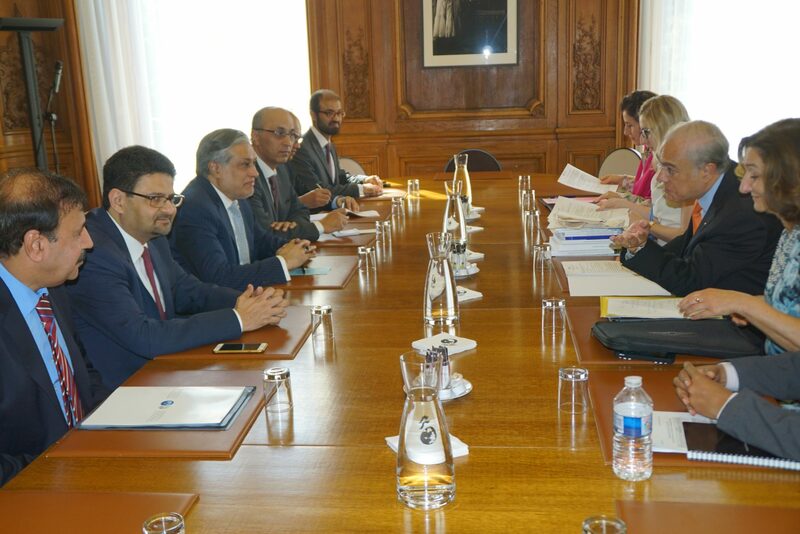 The Finance Minister is on an official visit to Paris, France accompanied by Dr. Miftah Ismail, MOS/Chairman Board of Investment and a business delegation. 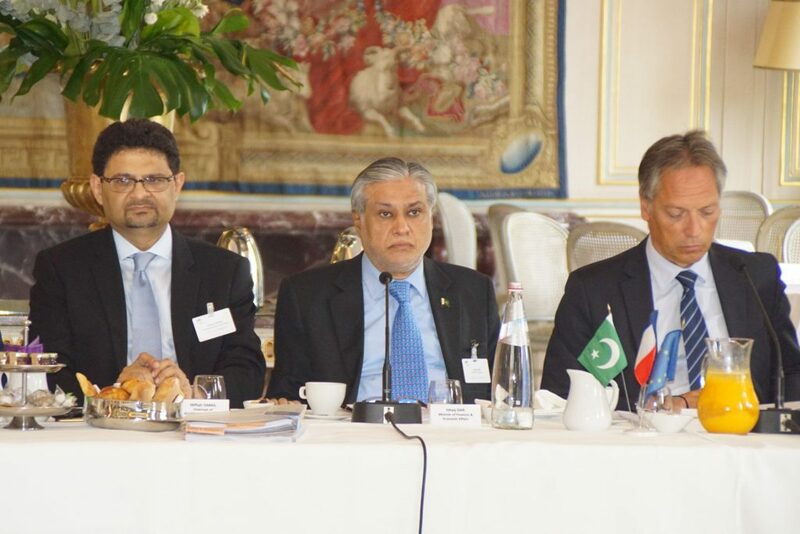 Paris, September 14, 2016: Senator Mohammad Ishaq Dar, Minister for Finance, Revenue, Economic Affairs, Statistics and Privatization held meetings with two leading French automobile manufacturers, Renault and Peugeot, in Paris today. He briefed them about the recently announced automobile policy of the Government of Pakistan which has given attractive incentive and concessions for foreign investors. He emphasized that with the resurgence of Pakistani economy in the last three years, manifested in macroeconomic stability, sustained GDP growth, and stable exchange rate and increasing consumer spending, there is a strong demand for new cars in the country. He invited them to set up their manufacturing plants in the light of the new policy and growing demand. 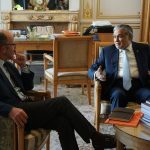 The Senior Executives of both Renault and Peugeot lauded the remarkable turnaround in Pakistan’s economy and expressed serious interest in investing in the automobile sector in Pakistan. Chairman BoI, Ambassador of Pakistan to France and French Ambassador to Pakistan were also present during the meeting.